When photographing a wedding, I'm always looking for a new and unique angle on an otherwise familiar photo. When it comes to photographing the father of the bride and his daughter walking to the wedding ceremony, whether it be down a staircase like in this photo, or down a path on the way to the church, it's very easy to take the same style of photo at every wedding - front on, with a look of nervousness on the brides face usually! 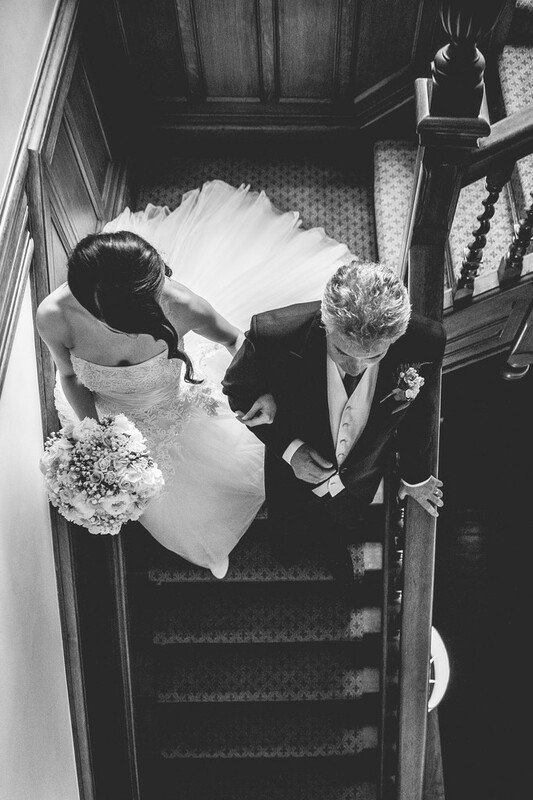 Pendrell Hall has a staircase at the heart of the venue, and I knew from my pre-wedding visit that the bride was getting ready upstairs, and would have to make her way down these stairs on her father's arm in order to make her way to the wedding ceremony. I chose not to take a standard front-on photo; The stairs were quite steep and shooting up at people can be unflattering. Instead I opted to take the photo from the balcony above the stairs. This offers a unique view, allowing the wedding dress and the train to be shown off in all their glory, as well as the bridal flowers. Shooting from this angle is also good photojournalism in that you can see and understand exactly what is going on without any real need for words to act as a description.